Report builder is automatically enabled in new Salesforce organizations. For existing organizations, you may need to enable it. If report builder is automatically enabled in your Salesforce organization, then you won’t see any options to turn it on or off in Setup. It’s always on! If report builder isn’t automatically enabled in your Salesforce organization, then you can verify that it’s turned on in Setup. Enter Reports and Dashboard Settings in the Quick Find box, then select Reports and Dashboard Settings. Review the Report Builder Upgrade section of the page, and if necessary, then click Enable. If you don’t see the button, report builder has been enabled for your organization. Confirm your choice by clicking Yes, Enable Report Builder for All Users. Now, to build a new report, you just need to open the report builder. From the Reports tab, click New Report. Then, select a report type. Choosing the right report type is one of the most important steps in building a report. When you pick a report type, you’re picking the records and fields you’ll be able to see in your report. At this point, let’s press the pause button and make sure you understand how report types are structured. Each report type has a primary object relationship and a field layout. Primary object with related object—Records returned are only those where the primary object has at least one related object record. In our example of Opportunities with Products, the only records that would be displayed on the report would be opportunities that have at least one related product record. 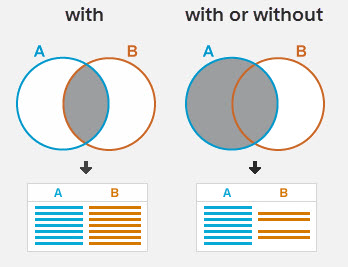 Primary object with or without related object—Records returned are those where the primary object may or may not have a related object record. If we were to create a custom report type, Opportunities with or without Products, then opportunities would be displayed whether or not they have a related product record. You can have up to four related objects, and each can have the “with” or “with or without” distinction. The field layout determines which fields the report type includes. Fields often translate to “columns” in a report. A single instance of an object (a record) is described by a set of fields, and each field also has a type. Field types include Text, Number, Checkbox, and Date/Time. For example, each opportunity record has fields (with field type in parentheses) like Account Name (Text), Amount (Number), Closed (Checkbox), and Close Date (Date/Time). Don’t see the fields you want after selecting a report type? See too many fields? You may need to create or edit a custom report type that adds or hides fields. To create, edit, or review report types, from Setup, enter Report Types in the Quick Find box, then select Report Types. You can’t edit standard report types. Now that you’ve got that down, let’s help Maria build and filter a report. Lance Park, the Sales Rep, mentioned Maria on Chatter to ask for a report of accounts who are direct customers. Go to Reports and click New Report. Select the ‘Accounts’ report type and click Continue. To begin filtering, click FILTERS. Optionally, set the Show Me standard filter to All Accounts and Created Date to All Time. Don’t forget to click Apply after editing a filter! Click the Show Me standard filter and select My accounts. Click Apply. Click the Date Field standard filter and select Created Date. For Range, select All Time. Click Apply. In the filters pane, click Add filter... to include a Field Filter. Under Value(s), select Customer - Direct, and click Apply. Save your report as Direct Customer Accounts and accept the auto-generated unique name. Nice job! You’ve just created a report filter that shows all of your Accounts where the Type = Customer - Direct. Click Run to see your results. Please note, depending on which org you’re using to practice these steps, you may or may not see data in your report at runtime. In the above example, we used the Equals operator to create our filter, but there are a number of operators you can use in building your reports. However, a word of caution: Watch your performance carefully when using Not Equals as an operator. It may cause your report to run slowly or time out. Check out the full list of filter operators in the Filter Operators Reference. Now that you’ve built a filter, let’s take this to the next level with cross-object filters, or “cross filters.” These allow you to extend your report types to objects related to the original objects defined in the report type. Cross filters help you fine tune your results, without writing code or using formulas. The most common use case is exception reporting. Here are some examples that the Sales team at Ursa Major Solar has requested. Stale Opportunities - Opportunities without activities in the past 30 days. Erin doesn’t want to waste time calling these opportunities. Orphan Contacts - Contacts without accounts. Lincoln wants to add these contacts to accounts, or else scrub them away. Neglected Accounts - Accounts with no opportunities. Lance would like to spend the afternoon doing outreach to these accounts to see if there is any interest. Now let’s help Maria help the team by creating a report with a cross filter! Let’s select the ‘Contacts & Accounts’ report type and click Continue. Click FILTERS, then click the More Actions arrow and select Add Cross Filter. Select a parent object from the Show Me drop-down list. Your choice determines which related objects you see in the child object list. Select Contacts. Choose with as the operator. Select a child object from the Secondary Object drop-down or search by its name. The drop-down list contains all eligible child objects of your selected parent object. Select Opportunities and click Apply. Select a field. The fields are determined by the child object in the cross filter. 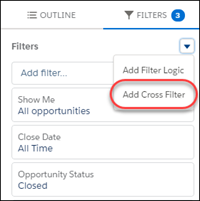 For example, if your cross filter is Contacts with Opportunities, you can use opportunity fields for your subfilter. Select Stage for our subfilter. Select equals for the operator. Under Value(s) and select Closed Won. Name the report Contacts & Accounts with Closed Won Opportunities. Click Save. Good work! You’ve created a report that shows Contacts & Accounts, where the contacts are related to opportunities that are Closed Won. This kind of report will help the team identify contacts to invite to a “solar celebration” for customers who are taking a bite out of their energy bills. If you add another subfilter on Opportunity Amount or Close Date, you can learn more about how big the deal was or when it closed. But filters 2 and 3 conflict with each other; causing the report to return no data. To make this report work like we want it to, we need to add filter logic. To add filter logic open the filters pane of the Report Builder by clicking FILTERS. Then, click Add Filter Logic. Finally, specify how filters should apply to the report. Here are the operators available for applying filter logic. To give Erin what she wants, set filter logic to 1 AND (2 OR 3). Now the report only contains accounts owned by Erin who are either customers or resellers. With this report, Erin is sure to crush her quota this quarter! Filter logic doesn’t apply to cross filters.